Hedonism. are you aware that there is a 4 battle reoprts per player a week cap? Story: Ran into some Renagade Tau was force back towards the manufactorum. 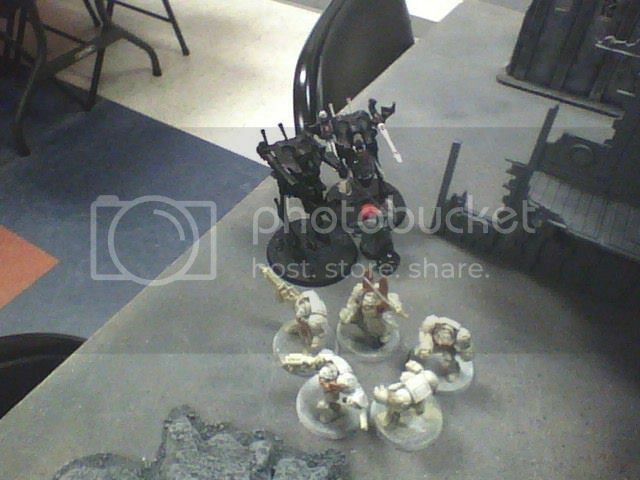 Riptide killed 9 ravenwing bikers in reatailation to Black Knights killing off Tau Crisis Suit Commander. Story: Grey Knights were investigating the crash site the Dark Agnels had discovered Castellen Crow and McManus got into a heated argument that got them challenging their egos. 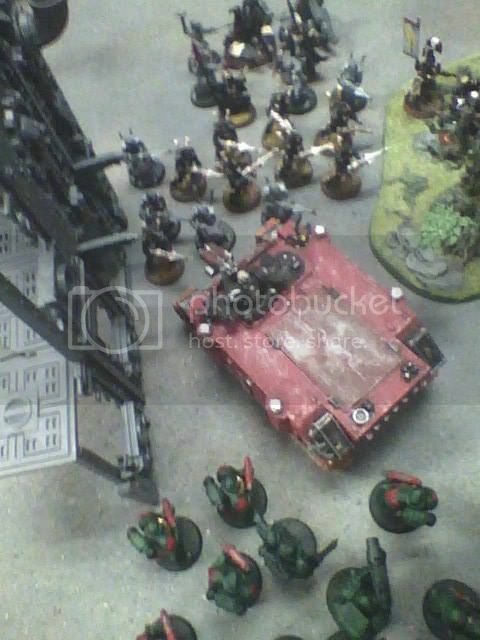 The training exercise began and it proved the Dark Angels were better not to be messed with! Castellen Crow ran off the table being chased by McManus himself on his jet bike. Ravenwing held 3 ammo dumps. Hedonismbot wrote: Aren't the grey knights in my faction specifically Furrby's? Then shouldn't the only battles fought against gk's for that to count be against Furrby himself? If he can get points for the faction playing GK then I can get points for my faction playing VS. GK. The Dark Angels will prevail in rooting out corruption where the inquisition has obviously failed. Are you sure it wasn't simply because the Gk's found out about the fallen angels and you had to silence them? I am very aware of your chapter's dirty little secrets monkeigh, you really aren't any better than the chaos followers you seem to hunt down all the time, at least they aren't in denial about their true nature! You should kill those chaotic neutral GK's. I hear they smell quite offensive. It was a lazy afternoon and the sla....I mean, voluntary workers were building the airfield for Blood Wings..when suddenly, a siren started to go WHOO WHOO. The airfield was under attack, and quite suprising one. Our fighter brought down a few drop pods, but one landed, followed by teleport strike of Lord Belial and Deathwing terminators. We could see silouethes of tanks, closing in, vanguarded by motorbikes. All we could do was call for help. A few Valkyries dropped by...followed by other...Plenty of dakka happened. The pressing wave of Dark angels was slowed, and then stopped and pressed back. Our losses were high as well, but we swamped the terminators with our bodies and litterally drowned them in corpses. 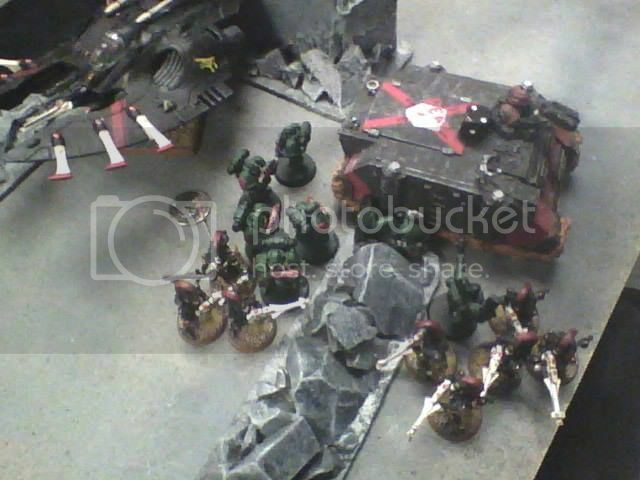 Enemy was bitter and stubborn, as Dark angels are. Death of his comrades and the wall of lead from low attitude flying Vulture gunship enraged Lord Belial so much, that he pushed his terminator armour on 130%, jumping up and smashing the Vulture with his thunderhammer. Epic. We got footage of that. But even his personal bravery could not change the result of the battle. He teleported back to orbit a few seconds before other barrage of OVERKILL vaporized the place, where he was standing. The enemy lost his moment of suprise and mobility and desided to withdraw...we could finally finish the airfield, yay! Story: With the treacherous Guard at our back door the raveniwing came to help their fallen commrades. Both sides took heavy tolls but were still in a heated deadlock. - Ravenwing assaulted the landing pad that those treacherous guard were hiding on. Hedonismbot wrote: Nice, that should quiet those Dark Angels for a bit. Remember that your pics count for another cvp. You should be getting 4 for your game instead of 3. You would think that....Guess Again! Ribbons Earned: None, nobody likes me. After great betrayal of imperial forces inquisitor Dragonuv set his aim in vengeance. Because he stationed near palid woods he decided to hit imperium right in the face taking over city of Eastwood. Detachment of badly painted ultramarines were defending their positions but after spearheading assault at dawn with heavy hitting units it was not clear what will happen. 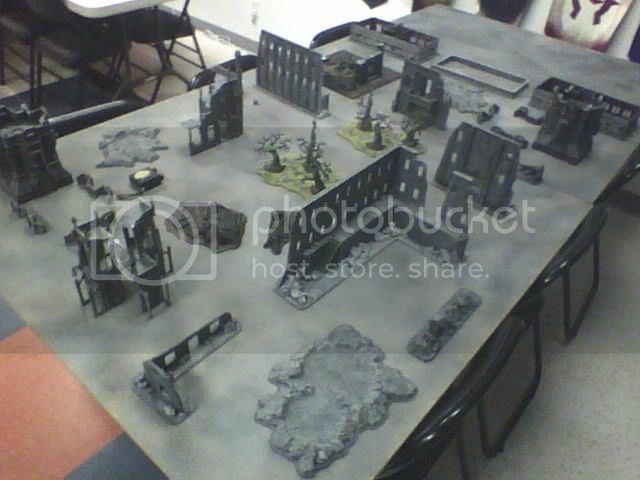 Long day fight made it objective victory for inquistor and opened his way to the north. - Played cities of death scenario. Your hate makes me stronger. The enemy forces sent in a small infantry detachment of a platoon first, along side a Leman Russ and some weapon teams as support. The narrow streets meant that the full army was not able to make their arrival in proper order. Basically enemy was checking up tournament heavy flyer list with vendettas and other stuff. Not really fluffy battle i was experimenting with my list and because we rolled the scouring he had massive advantage but i managed to choose vendettas as targets and earn the points. It was fun game. Story: During his travels with the Dark Angels, Noldoth decided a mock battle would be a good experience for both sides to broaden their tactical prowess. This was a training mission. Dire Avengers cornered and locked in combat by marines, and they actually managed to survive too! Guardians trying to sneak around a Rhino Blockade to get to an objective. He tar-pitted my walkers with his warlord, worked really well actually, because it wasn't until I sent my avatar over there that his captain died, and he managed to get rid of 1.5 walkers too. He was going to send those terminators over there, but my guardian mob took care of them.